The Ju-Ju-Be Legacy Collection Super Star Large Travel Duffel Bag is a smart bag that will make you look chic while traveling for an overnight or quick weekend stay. This bag might be the real star of the show, but if the paparazzi come chasing you, don’t be surprised. Keep yourself ultra-organized with its U-shaped bag opening allowing for easy access to all of your important belongings. Wide, comfy straps make it the perfect size for carrying. Of course, it’s machine washable. Doesn’t just have star power- it’s Super Star power! The lining is protected with an Agion natural antimicrobial treatment that inhibits and reduces the growth of odor-causing bacteria, mold and mildew. The outer fabric is treated with Teflon fabric protector, making it easy to repel stains and keep it clean. The front pocket is large enough for smartphones, wallets, keys and even your plane tickets. 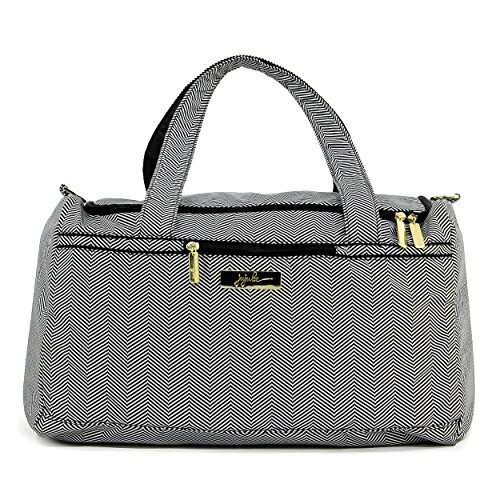 The inside is spacious enough to hold an outfit or two, a pair of shoes, cosmetics and more. On the side of the bag there are (2) D-ring loops to attach a messenger strap (sold separately) for extra versatility. The back pocket has (2) button snap-closures and is perfect for holding magazines, reading books and more. The Queen of the Nile design is a black and white herringbone fabric that's lined in shiny beige and detailed with gold colored metal hardware. This bag is machine washable and measures 20-inches by 12-inches by 13-inches in size. The Ju-Ju-Be Legacy Collection Super Star Large Travel Duffel Bag comes with a 90-day limited warranty to protect against manufacturing defects. Founded in 2005, Ju-Ju-Be is a Southern California company that fuses science, style, and attitude to create diaper bags, purses and other accessories that are both fashionable and fun. Ju-Ju-Be assimilated the most advanced technology possible to create a stylish and intelligent product line that's unrivaled in the industry.